My daughter's riding instructor asked if I would make her a special card for her mother for Christmas so I thought I'd better get a shift on before it's too late. I also made a couple to add to my general Xmas card box but goodness only knows when I'll get a chance to write them, far less send them to anyone. There's always next year!! Stop the bus!! ... I wanna' get off !! 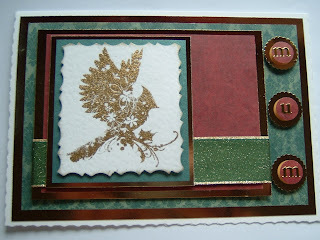 These gorgeous Inkadinkadoo stamps are from the Winter Birds Collection and the detail in them is absolutely beautiful. As usual my photos leave a lot to be desired but you'll get the idea. 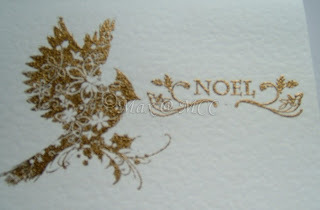 I used gold and silver embossing powders but they would look equally stunning just as black silhouettes. If I had dug them out earlier then I may well have managed to make enough cards for everyone this year as they really need little else added to make a lovely card. 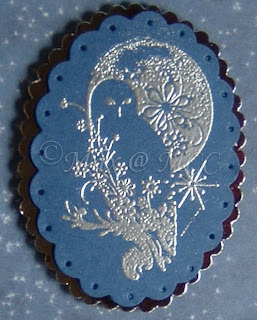 These stamps are just gorgeous Max - I haven't got them but I have got the normal bird set. Try them on acetate with either black or white Stazon - fabulous effect. That Christmas tree stamp you asked about is an Anita's one (not a favourite brand of mine but from the days before I discovered really good stamps). 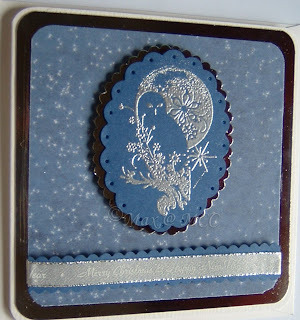 Max these are stunning, i love the stamps you have used and the layouts really show the images off. I am a happily married mother of 2 whose current passion is papercraft ~ primarily cardmaking and scrapbooking but I've dabbled in many different things over the years and will no doubt always enjoy dabbling. I am lucky enough to have a VERY tolerant and patient family, who allow me to be me ... mess and all. 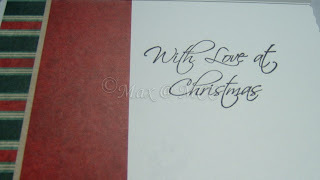 Unless otherwise stated, all content, including text, photographs and design ideas are ©Max @ MCC. The images and ideas that are shared here may be used for your personal inspiration with my pleasure. Visitors may share the content shown here via a direct link, but may not copy, reproduce or redistribute it elsewhere without prior written permission. Links are provided for convenience only and no responsibility is accepted for the content of other sites. The inclusion of links does not necessarily imply a personal recommendation or endorsement of the content displayed, nor of the views expressed there.